Ignore the hype regarding gold, bonds, booms and busts, hope and chains, “shock and awe,” stock market crashes, “money honey” commentary, and ignore the politicians. Don’t obsess over High-Frequency-Trading and market manipulation. Instead, focus on the big picture as shown in the following chart of monthly gold, which has been divided into 3 phases since 1971. Phase 1: Gold rallied from about $42 in 1971 to over $800 in 1980, thanks to massive money printing, debts, deficits, wars, and a loss of confidence in the US dollar. 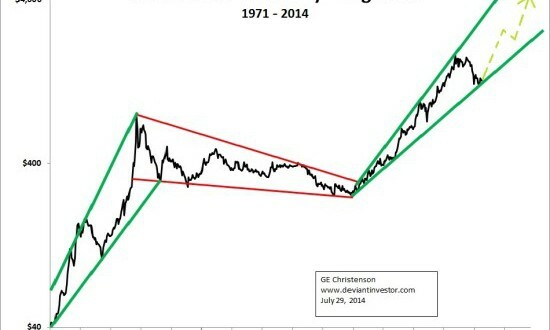 Phase 2: Gold prices crashed subsequent to the bubble of 1979-80, and then drifted lower for about 20 years. It double bottomed in 1999 and 2001. Phase 3: Gold rallied off the 2001 low of about $255 to over $1,900 in August 2011. Since then it has corrected to under $1,200, and double bottomed in June and December 2013. Current price is about $1,300. How Will Gold Prices Change in the next 3 – 5 Years? Option 1: Gold prices will continue rising, erratically of course, within the green “megaphone” pattern shown above. In my opinion this option is the most likely unless we descend into a global deflationary depression and/or nuclear winter, which the politicians and bankers will do “whatever it takes” to avoid. Option 2: Gold prices continue falling much like they did subsequent to the 1980 bubble high. I consider this option unlikely.